So I love RIS. I've been making more Barleywine and such lately, but I made a RIS a month or so ago for the Christmas brew. I opened one up, and it just isn't where I want it. Same as my last RIS. Maybe I just don't like Roasted Barley, I don't know, and maybe it was just because the body is a little thin, but my RIS just doesn't taste the way I would like. My question is, could this be because I'm using american malts? American chocolate and roasted barley. Is there that big a difference in flavors between something like Briess and Muntons? Or am I kidding myself and I really need to go back to basics? Uninformed Opinion here: I don't think it is the difference between maltsters, not on something that's 500L - There just can't be all that much difference between them when they are roasted that dark. Now, I am absolutely certain there are HUGE differences between 2 maltsters' Munich, Vienna, etc... malts that have a lot more room for interpretation. But roasted, unmalted barley? Meh, I am not seeing it. You have no variation in the germination bed - where a great deal of a malts character is developed (since it never goes). You have potential for Varietal and Roast variances - and given the degree of roast, I just don't see it as a big deal. I have to agree with Ray. I think that most of the subtle differences are going to be literally roasted away. So ground up need to improve my stouts, not what I wanted to hear but probably what I need to hear. Time to start looking at clones, books, and water profiles! Maybe give the cold steeping method a try… get the color with much less of the roast, although I always seem to get some coffee flavors that way. Yeah I've cold steeped, I'm typically a fan for things like dry stout but less so for RISs. Also going to try adding at Vorlauf. A few one gallon batches are in order. You need to consider that 1) US maltsters use different varieties of barley than UK maltsters; 2) every maltster uses different proprietary processes; and 3) every maltster has a different interpretation of their target product. For instance, Breiss Roasted Barley is 300L while Fawcett Roasted Barley is 500L; and consider the ~15L variation on Munch malt between maltsters. It doesn't matter which one you choose, just as long as you know what you're getting, like the character, and stick with it. Do you ever use maltodextrin? I never had, but I'm lead to believe it's usually added to increase the body. I just don't know if it will add sweetness like adding lactose would. Maltodextrin is similar to using Carapils, body and mouthfeel with trivial flavor addition. Shouldn't add any sweetness per se. I'll just make the same beer twice, only variation will be where the malt comes from. Briess versus muntons, and I'll see which one I like more, or if they are even distinguishable. Count me of the opinion that different malster's products are going to be different for the reasons KidMoxie said. Start at a high temp and roast short duration or start low and roast longer? Could get the same color either way, but the flavor profile could be different. The roasting could penetrate shallow into the actual kernel or it could be through and through. I think there are going to be differences, especially in a 300L product vs. a 500L product. I'm also of the opinion that RIS should be huge. Like 11% or bigger. 8% RIS? nah. There aren't many sub 10% beers on the BA top 100 RIS list. The FG of a RIS should be really high. Way higher than you're comfortable with. 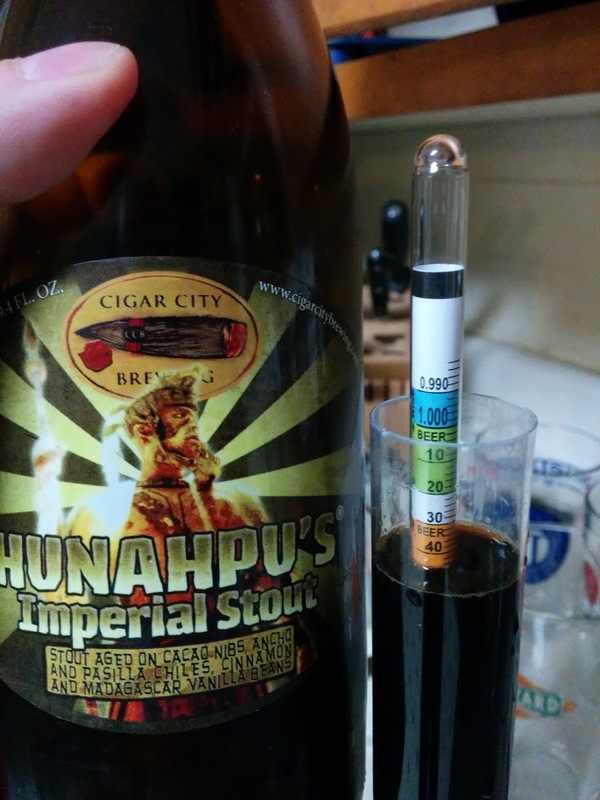 Hunahpu FG is 1.042-1.044. I actually put my hydrometer in some. If you google around, you can find a pic of Dark Lord with a hydrometer in it and it reads 1.036 or thereabouts. So don't do the traditional "mash low" to get attenuation thing. Consider 152-154 for mash temp. Treat the yeast right and they'll do their job. I'm a fan of these rough percentages for the grain bill, and since you use so much of each type you can use multiple kinds to get more complexity. Use multiple base malts, multiple different crystals and some pale chocolate as part of the chocolate malt. The black malt is the only think over 350L. I think the high L roast malts can get acrid, but you do need some substantial bitterness to come from the roast grain. These percentages come somewhat from Terrapin Wake n Bake Oatmeal Coffee Stout. I like Warrior for hopping. Seems to work well with the profile. Most importantly, I think, is age. These need some time to really shake some of the harsh bitterness from the roast and the aggressive hopping. Oxidation of the caramel malt flavors really adds depth and complexity, IMO. Ohhhh yus. Let's talk RIS. Everything else Maris Otter, hopped with Challenger and fermented with 1728. I'm thinking I'm going to use the Muntons roast malts with a split between Chocolate, Roasted Barley, and Black Patent. Still have the split between C150 and C60, or remove C60 all together. I typicallty use the OG/IBU ratio that's listed in Designing Great Beers. And yeah, age is a factor I think, but I'd rather have age improve a great beer than have it improve an average beer. Are you using flaked barley? If not, I would recommend it. Also, maybe consider a different yeast? Maybe that yeast doesn't leave enough residual dextrins or doesn't produce enough glyceride for the mouthfeel and flavor you want. Do you really need flaked oats *and* flaked barley? I'm with KidMoxie, I don't really see why I would need both, but I'm open to it! And man, different yeast is going to be tough. I love 1728. First beer I ever medal-ed with uses it, and I use it for a lot of beers. Overall, it it usually great for mouthfeel but tends to leave a sweeter beer. It's a great jack of all trades yeast, and is really ABV tolerant. I could give something else a shot for sure though, maybe London ESB? Works really well in my Old Ale. Or Dry English Ale Yeast since it is a bit more ABV tolerant? WLP090 is an option too if I wanted to go with a bit more of an American spin, but if that is the case (which it totally might end up being) I think I would just go Pacman.